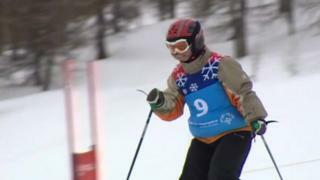 Four skiers from Kent have been competing in Special Olympics Great Britain's National Alpine Skiing championships, which are taking place over five days in the French resort of Serre Chevalier. A total of 79 skiers, all with learning disabilities, are taking part in nine different races including slalom and giant slalom. BBC South East Today speak to Wayne McCarthy, Jane Andrews and Alison Tully, as well as organiser Remy Roget.